Portuguese (Portugual) keyboard labels convert any keyboard to a Portuguese keyboard with high quality labels that provide for years of use. These opaque labels will completely cover your keyboard's original legends. The Portuguese (Portugal) keyboard labels conform to the Portuguese (Portugal) keyboard layout in Windows XP. The labelsare printed on high-quality, durable Lexan® for years of use. The labels areopaque which will convert your keyboard to a Portuguese layout. This language is supported inWindows Vista, XP, ME, 98, and 95. Note: this label set is not compatible with Portuguese as written in Brazil. We have the Portuguese Brazilian labels that matches the keyboard layout used for Portuguese in Brazil. This language is supported in Windows XP, ME, 98, and 95. 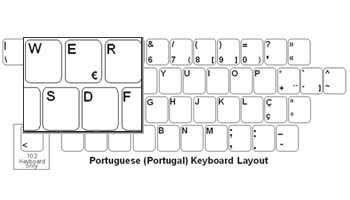 Portuguese (Portugal) labels are avery economical option for creating a Portuguese (Portugal) keyboard.The language labels use an easy peel-and-stick method to install. They will notdamage the original keyboard key. The letters areprinted on the underside of the labels so that thelettering will not wear out. This affords you with many years of durableuse.